Negotiation Excellence: Successful Deal Making is written by leading negotiation experts from top-rated universities in the US and in Asia and its objective is to introduce readers to the theory and best practices of effective negotiation. 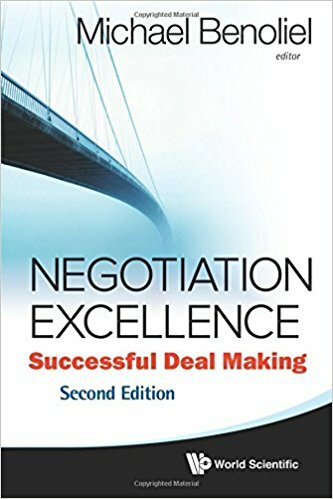 The book includes chapters ranging from: preparing and planning for successful negotiations; building relationships and establishing trust between negotiators; negotiating creatively to create mutual value and win-win situations; understanding and dealing with negotiators from different cultures; to managing ethical dilemmas. In addition to emphasizing the link between theory and practice, the book includes deal examples such as: Renault–Nissan alliance; mega-merger between Arcelor and Mittal Steel; Kraft Foods’ acquisition of Cadbury PLC, Walt Disney Company’s negotiation with the Hong Kong government; and Komatsu, a Japanese firm’s negotiation with Dresser, an American firm. Following the success of the first edition, the second edition re-emphasizes the spirit of linking theory to practice with two new chapters on emotions in negotiation and the Indian negotiation style.